What are endocrine disruptors? What do they have to do with a luscious Skin Food Smoothie, that combines an all-star lineup of blueberries, walnuts, spinach and kiwi? The World Health Organisation (WHO) defines an endocrine disruptor as “an exogenous substance or mixture that alters function(s) of the endocrine system and consequently causes adverse health effects in an intact organism, or its progeny, or (sub)populations”. In layman’s terms, endocrine disruptors are hormone altering chemicals (which sounds like the premise of a moody dystopian novel, but is in fact reality). Since the endocrine system regulates important biological processes in the body, including development of the brain and nervous system, growth and function of the reproductive system, and metabolism and blood sugar regulation, as well as the functions of the ovaries, testes, pituitary, thyroid, and adrenal glands… endocrine disrupting chemicals (EDCs) are a cause for concern, to put it mildly. So, how can contact with EDCs be minimized or avoided? It’s important to know that EDCs are commonly found in drinking water, plastics, and in cleaning products and cosmetics that are absorbed through the skin. Hence this Skin Food Smoothie, created to nourish the largest organ in our body that is commonly under assault by EDCs. The Environmental Working Group has compiled a list of the 12 Worst Endocrine Disruptors (BPA Dioxin, Atrazine, phthalates, Perchlorate, fire retardants, lead, arsenic, mercury, perfluorinated chemicals, Organophosphate, pesticides, glycol ethers) with advice on how to avoid them. They have also created an entire database of cosmetics, to help us educate ourselves on the risk levels of the products we have incorporated into our routines. Since much of what you put on your skin reaches your bloodstream, take a moment to determine whether or not your beauty products and cosmetics to your body burden of toxic chemicals. Now, this highly-customizable Skin Food Smoothie is a delicious way to positively impact your skin. 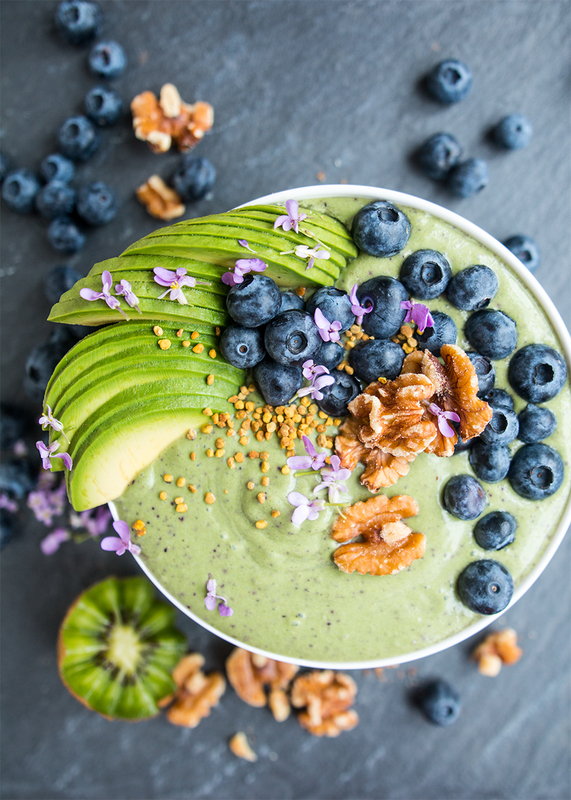 While it’s somewhat difficult to determine which claims are substantiated by research, some foods are more commonly associated with firmer, younger-looking, clear skin more often than others (Google it): blueberries, leafy greens such as spinach, kiwi, and walnuts. While fish is often cited as one of the top foods to promote skin health, it doesn’t quite work in a smoothie! 😉 I added avocado for its creaminess and beautiful green color, plus coconut cream to tie it all together, and a sprinkle of bee pollen and edible buds as garnish. You’re welcome to add and subtract ingredients according to your preferences, the important thing is to minimize your skin’s contact with disruptive chemicals, and encourage its health with beneficial ingredients in your homemade meals. Puree the smoothie ingredients with a handful of ice cubes until very smooth and creamy. Pour into bowls or glasses, then top with the garnish ingredients (if desired). Serve cold. I used coconut cream to keep the consistency very thick, but if you're not a fan of the taste of coconut, hemp milk is recommended. This looks so good!! I love your pictures – the avocado looks perfect and I love the tiny purple flowers! Ooooh my! Looks beautiful, and it’s good for you too! Pinning. This look so amazing and your photos are beautiful! I’m a smoothie junkie! I’m going to have to try this one out. BEAUTIFUL photos! And bonus points for a smoothie with avocado – don’t see that very often but I love smoothies that have it! Avocado is so fun in smoothies! Creaminess ftw. This looks so beautiful and sounds delicious! My go to smoothie is banana, frozen berries, fat-free yogurt and spinach leaves. I’ll have to give this one a try. This looks fantastic. I love a good green smoothie but never considered adding avocado! Oh, it’s the best! More creaminess, is why I love to add them. This sounds (and looks) amazing! Very unique garnish too! You make the most beautiful bowls!! This sounds delicious and it’s so good for you too!! This looks delicious! I usually use spinach in my green smoothies, but looks like the avocado makes it super creamy! Yes, totally why I love it. This is so PRETTY!!! I love lots of these ingredients in my smoothies too. I’m going to have to try this smoothie, not only because it sounds delicious but because of it’s health benefits. Thank you for sharing this info and recipe! You made the prettiest smoothie bowl i have ever seen!! green and tasty!! want wait to try it out. I think “Endocrine Disruptors” was Orwell’s lesser known prequel to 1984. #spoileralert smoothies cured everyone. Hootie hoo! Look who didn’t sleep through high school lit class, you get a gold star.